Roast spaghetti squash: Cut spaghetti squash in half, lengthwise. Scoop out seeds. Brush inside with oil. Place facedown on baking sheet and bake for 40-50 minutes, or until you can pierce with a fork. Simply scrape out “spaghetti” with a fork. When the squash is about 15 minutes away from finishing in the oven, heat a large pan over medium-high heat. Once hot add chicken, and a pinch of salt and pepper. Brown chicken on both sides, about 8 minutes total. Remove from pan. Add shrimp and sear until cooked through, about 1 minutes. Remove from pan. Add another splash of oil to the now empty pan and then add garlic, onion, carrots and mushrooms and cook until soft, about 5-7 minutes. Add in bean sprouts, 1/2 of the scallions, 3 cups of the cooked spaghetti squash and the cooked chicken and shrimp. Stir to combine and then create a well in the center of your pan and add eggs. Let cook and mix well, so that the eggs are scrambled and incorporated. Low the heat and add coconut aminos, rice wine vinegar, coconut sugar, red pepper and garlic and stir to combine. Serve immediately and add the optional garnishes of lime, remaining scallions, and peanuts. Recipe instructions updated March 2019 to make steps easier. Additional updates included the change from teriyaki or oyster sauce in place of the now instructed coconut sugar. The older recipe called for 2 tablespoons of teriyaki sauce. You can also use fully cooked chicken with the recipe, as previous version suggested. Just place shredded or diced cooked chicken in step 5. Hi! Looks amazing. Do you know the nutritional information for this recipe? This needs way more sauce. I doubled the sauce and then added more vinegar and aminos and garlic because it was bland. It also needs cilantro. What would be a good substitute for Oyster Sauce? Could I use Fish sauce? any recommendations? Hey Paige! Fish sauce would be delicious, or any type of clean teriyaki sauce (if you have one you like) would work too! After the spaghetti squash is cooked how much, in weight should I use? The size of the squash in my area differ greatly. Great question Danielle, I just added that as others may be wondering the same. About 3 cups! If yours is more, you can use it all but you may want to adjust/add additional sauce at the end. Hi Lexi, did you happen to list how many servings this is? Thanks! Just curious what coconut aminos could be substituted with? Any type of soy sauce! I absolutely LOVED this recipe! I hardly made any modifications, other than adding red peppers (I just love them!) and replacing the oyster sauce with a vegetarian oyster sauce. The sauce was to die for! Thank you the recipe. My fiancé asked me to add it to the rotation so it was definitely a hit in our home. Keep on posting! You’re the best! I’m so happy you and your fiancé loved the dish! Lexi, this recipe is so brilliant! I was dying to try this but I had no shrimp, chicken, or eggs, so I decided to try boost the veggie-count (more of the veggies listed, plus chopped celery). Also, I used a GF teriyaki sauce (San-J brand) in place of making my own. The dish turned out to be SO delicious, thank you for the inspiration! I HAVE 1/2 A SQUASH LEFT. I AM TRYING THIS TOMORROW! What is the oyster sauce you use? I don’t usually bother with comments but this was absolutely delicious! I tweaked the sauce to suit what I had in my pantry. I used low sodium soy sauce, fish sauce, 1.5 tbs of cider vinegar 1.5 tbs of water, I also added the juice of half a lime and a little bit of honey. I will definitely make this again! The family loved it! Can’t wait to try this! What can I use instead of seasoned rice vinegar? I have plain rice vinegar and all the recipes I find online say to add sugar and salt to it. Hi! Looks awesome. Do you know the nutritional information for this recipe? Hi, do you have the nutrition breakdown for this recipe? 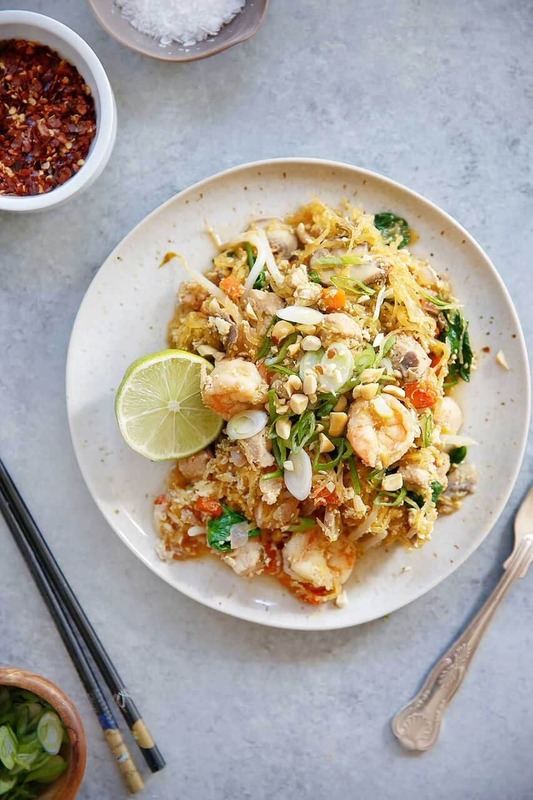 This looks amazing, but isn’t Pad Thai’s main flavor component Tamarind paste (or some substitute peanut butter instead because it’s readily available)? It’s it the peanutty flavor that makes it Pas Thai? Regardless, this looks incredible and I plan to try it. I’ve never ordered pad thai with peanut butter or sauce with peanut butter. I do have a chicken dish with a ‘paleo peanut sauce’ that you could add! I loved the pad Thai! Didn’t need any modifications! Was just curious if you had the nutritional information. This recipe is on my to do list since may 2014!!! I finally did it tonight, and OH MY GOD, amazing flavor. Added sriracha sauce at the end to make it spicy, and my fiancé can get enough of it. Thank you for this recipe!!!! I am SO happy you guys liked it!!! 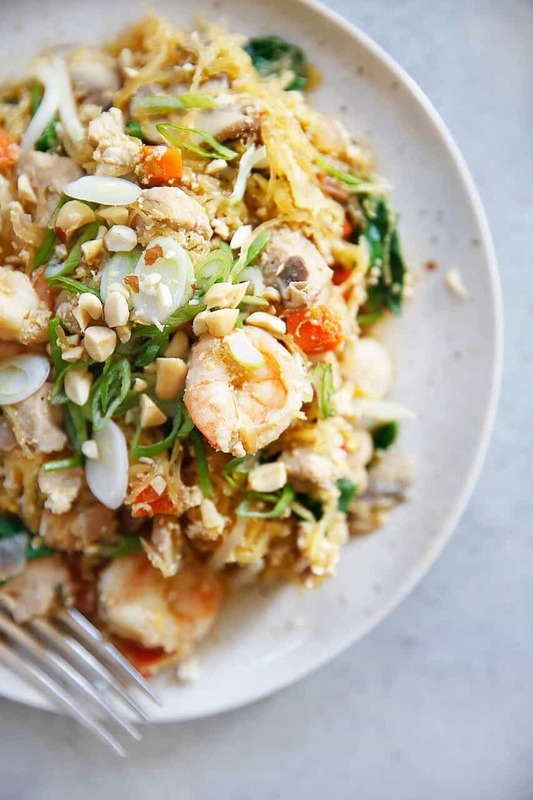 Ive been meaning to try a pad thai with spaghetti squash… Thanks to you Im going to try it tonight! Made tonight and loved it. When I make it next time I’m going to try cutting back on the rice vinegar. This was wonderful! I like mine on the drier side, so I just left it on the stove to cook off some of the liquid. I didn’t have seasoned rice vinegar either, so I just added some salt! Thank you for this recipe! Definitely cured my hankering for Asian food! wow delicious! This is my very first spaghetti squash endeavor and I don’t know if I’ll ever use pasta again! Even my manly fiancé loved it – said it was better than actual pad Thai 🙂 my only modification was a bit of peanut oil mixed in with the olive, zucchini instead of carrot ( because I had no carrot and the zucchini was on the way out) and red bell pepper. Thanks so much for putting this recipe out there! Tried this tonight and it was delicious. I modified to use two tablespoons of peanut butter. My fiance and I loved it and will be making it again!! Thank you! Mmmmm, looks good. I’m always on the lookout for tasty Thai recipes. I’m thinking I’d beat the eggs up, add some fish sauce and almond butter, but full speed ahead with the shrimp and chicken! Hi! A friend linked me to your site! I’m allergic to soy, peanuts, and tree nuts, what would you recommend I sub into the sauce? Thanks! Mmmmm, pad thai. I told my hubby that we are going to start eating spaghetti squash and zucchini and we both LOVE pad thai! This could be the recipe to convince him that it’s worth the swap! Yummy – will make again! I did modify double the sauce and it turned out great. I’m really excited about this recipe! Just curious though… I’m in the middle of a whole30. Do you have a suggestion for a substitute for the seasoned vinegar which has sugar? Thanks! can u explain what to do with the egg? I’m doing whiole30 too what can we use instead of rice vinegar? Thx!! Made the dish tonight – loved it and will definitely make it again. We mixed the eggs ups before pouring them into the hole. Once they cooked up I stirred to mix them in. We used oyster sauce instead of the coconut aminos. Where can you buy coconut amino acids? This is definitely NOT pad Thai. I made it exactly to the recipes specifications and it is my first whole 30 failure. My entire kitchen smells like stinky fish. Will be tossing and starting over with something else tonight. Ugh. That’s a lot of fresh produce to waste. I’m sorry you had a bad experience. Everyone really likes this recipe! I’m wondering why it smelled like fish, since you are using only pre-cooked shrimp in it? This recipe was a total disaster for me. A warning to those of you that might make this: if you overbake the squash, it’s not going to work. Mine turned into a liquid-y clump when I added it to the veggies. It just got worse as I cooked everything and once the sauce was added it was entirely flavorless. A real bummer. How long do you roast the squash at 350? Do you cut it in half to roast? I just got done making this, and it was delicious!! So easy, this is definitely going into my recipe rotation. This wasn’t the prettiest dish I’ve ever made, but it was very flavorful. I skipped the homemade sauce and just bought a clean Pad Thai sauce. It wasn’t nearly spicy enough for me either, so i added quite a bit more red pepper. Overall, good recipe. And lots of leftovers! The recipe looks good and I am excited to try it out. One thing I did notice and thought you should be aware about is one of the pictures on your post. In many Asian cultures it is considered very bad form and disrespectful to have chopsticks sticking out/standing in the bowl as it resembles incense being burned at a funeral and other funeral rituals. I just thought you should be aware. Traditional pad thai does have peanuts on the top. Will add cashews since I’m doing a Whole30. Thais use fish sauce in everything, so I added a dash of that, too. Also, I cook a lot and use tons of different recipes and never have seen anyone say “ground garlic.” Are you meaning garlic powder? Soooooo good! I did 1.5 the amounts of sauce and added a tablespoon of peanut butter and 1/2 a packet of stevia. This is a great recipe! I Modified the sauce to my preferences and it was delicious. My only problem was with the spaghetti squash not holding up and turning to mush. It might be I didn’t cook the squash right this time… Who knows. But it was still good. I think I am going to try it with zuchinni noodles next time. I have better luck with those. Oh my God. Made this tonight and it was amazing!!! Better than greasy Pad Thai from the local delivery place. My roommate says its the best thing I’ve ever made. Bravo! Thank you!! Cant wait to try this minus the shrimp since I’m allergic! Thanks for sharing. Flavor was good, needed a tad more sauce. The squash in an hour was way mushy and over cooked…but it was still tasty. Will make again and cook the squash less in the oven. This was amazing! I subbed zucchini noodles to save a little time and it was perfect. Thanks for sharing this recipe! Where does the egg come in? I also tried subbing zucchini noodles, and I wouldn’t recommend it. I agree with the comments that say it needs more sauce, else it is quite bland. I also don’t think it needs that much meat – maybe half the chicken with that amount of shrimp but more veggies would be more balanced, but obviously that depends on what your body needs! That would make sense as the sauce would be water-y with zucchini noddles and not absorb well. You need to use spaghetti squash and follow exactly! This is GENIUS! 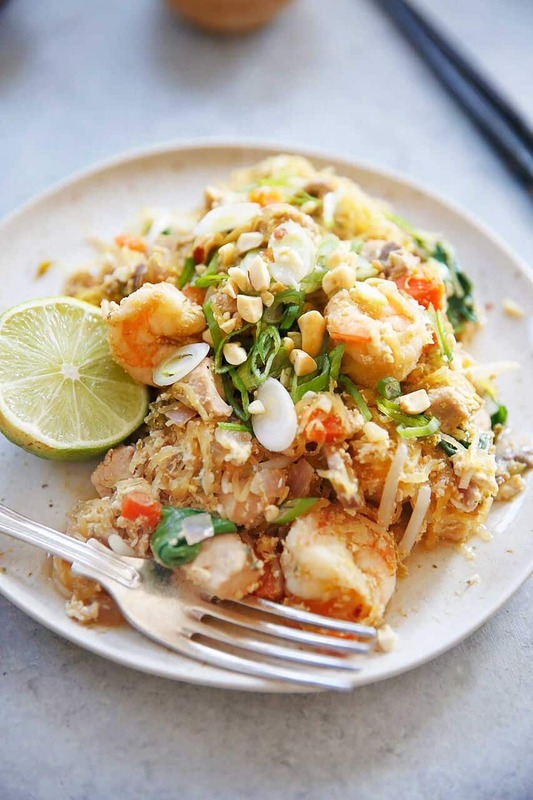 Pad Thai is one of my favs and love the spaghetti squash sub here.